I wrote this for my company blog back in September for Grandparent's day, but since it's one of my favorite blogs I've written for work I just had to share it on here too! Thinking about my childhood brings back memories of showing cows, putting in hay, riding bikes through the pasture and hanging out with my grandparents. Those who know me know that I am very passionate about agriculture, specifically dairy farming. My Grandpa is the reason why. Farming is in his blood. It’s in all of ours. 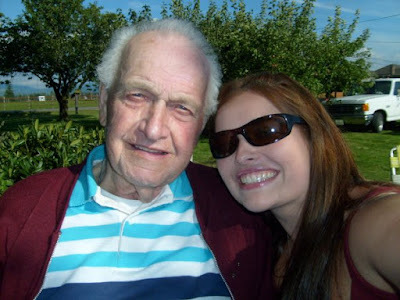 As a little girl, I would look forward to riding on the tractor with Grandpa as he mowed, raked or baled hay. This may sound boring, but it’s this quality time that’s so valuable. A few years ago, we had half a field of hay bales to pick up and no one else was around. So we took his pick up into the field and I bucked hay as he drove. Riding around the field on the tailgate while the cows in the next field looked at me like I was insane is just one example of all those precious memories with Grandpa that I will always cherish. He taught me a lot about patience, caring for cows and hard work. He also never missed one of our cow shows or my Dairy Princess events. I gave a speech at a senior center during my reign, and he went out of his way to be there. In the front row. Cheering me on. I love how farming brings families together. It certainly made my brother and me very close with our grandparents. I’ve had a stubborn show calf or two in my day and even when my patience was wearing thin, Granny’s persistence kept me (and the calf!) going. Sometimes I would get so frustrated that I wondered if it was even worth it. It was. She showed me that. Growing up on a farm builds character, a strong work ethic and strong family ties. I wouldn’t be who I am without that experience. Or without Grandpa. He is without a doubt my favorite person. 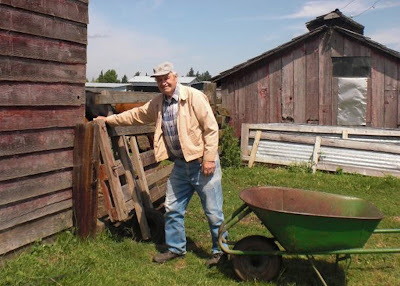 He is always there to help with whatever my brother and I need on the farm, and chatting with him in our old milk house about how dairying was back in the 1930s and ‘40s gets him going every time. I love how passionate he is about it. Maybe that’s where I get it? Grandparents are love after parents. They are the ones who play great role in a persons life.Teach, love ,care and are concerned about you like real parents. They are pure love in ones life.